Benefitting from a practical location in the centre of Reims, the Campanile Reims Centre Cathédrale is a great cost-effective base from which to explore Reims and the Champagne vineyards. Boasting all of the facilities and services that you would expect from a 3* establishment, you can expect a pleasant and comfortable stay. 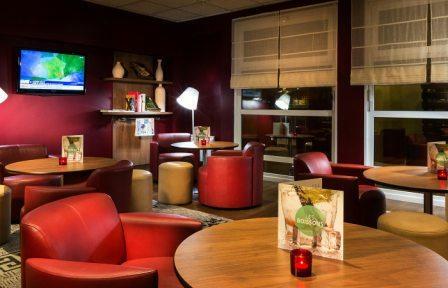 Although the main square is just a short walk from the hotel, a modern restaurant and lounge bar is available on site as well as a café with complimentary newspapers and hot and cold drinks. A buffet breakfast is served every morning from 6am until 9am and 11am at weekends. Ironing boards are available from the reception. The 81 double and twin rooms are pleasantly decorated in a contemporary style and each room is equipped with a sitting area, separate WC, air-conditioning and a safe. The televisions have satellite channels and tea and coffee making facilities are also provided. In each bathroom, there is a walk-in shower and a hairdryer. Complimentary WIFI can be accessed in both the rooms and the hotel’s public areas. The hotel benefits from an advantageous location in the centre of Reims, just a 15 minute walk from the station and 10 minutes from the famous Gothic Cathedral. This hotel is ideal for those arriving in their own vehicle as both an underground and outside private car park is available. Parking costs 10 Euros per night and must be booked in advance to avoid disappointment.